As the year-long touring schedule which followed the release of 2010's acclaimed double-album Field Music (Measure) wound down last December, Field Music were faced with the ending of an era: The community building which had housed the studio/rehearsal space they'd shared with The Futureheads for ten years closed its doors. Peter and David set to work immediately at building a new recording space on the banks of the river Wear in Sunderland and began to develop the fragments of music they'd amassed since the completion of Measure. Despite being over 70 minutes long, and including experiments with 'found sound' composition, Measure contained probably the most structurally coherent songs of Field Music's career. 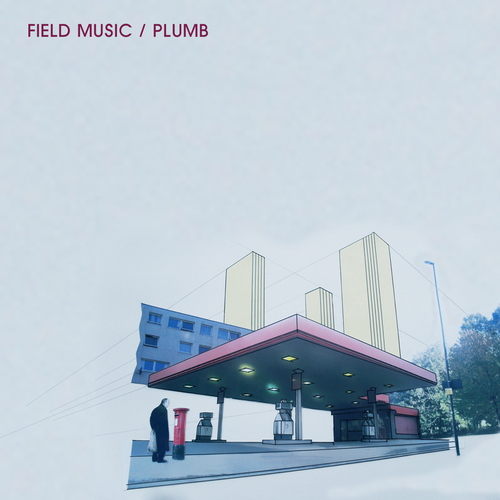 Plumb, with 15 tracks crammed into 35 minutes, abandons these conventions and instead remodels the modular, fragmented style of the first two Field Music albums; only now shot through with the surreal abstractions of 20th century film music from Bernstein to Willy Wonka and with the off-beam funk and pristine synth-rock developed on the brothers' School of Language and The Week That Was albums. Plumb digs into the age-old dichotomy between what is reflective or nostalgic and the disorienting immediacy of the outside world. Songs such as labyrinthine opener Start The Day Right, the chugging, minimalist Just Like Everyone Else and the all a cappella How Many More Times? recall those early-morning/late-night moments where dreaming, memory and the present appear fused together. Elsewhere, Who'll Pay The Bills?, Is This The Picture? and especially Choosing Sides, mine a caustic seam of ambivalence towards whatever passes for aspiration and sincerity in our hyper-mediated and mock-hysterical times. Whether the angle is personal or political, throughout the record there are allusions to the expectations and obligations we all amass. Can we live up to the expectations we had for ourselves when we had youth and naivety on our side? Can we be the people we'd like to be for the sake of our loved ones? When we feel so powerless, what's worth fighting for and what's worth fighting against? Field Music - Who'll Pay The Bills? Field Music - Is This The Picture? Field Music - How Many More Times?